Say goodbye to Acne scars in less than an hour with Bellafill. At Well Medical Arts we have years of experience using Bellafill so you can trust you are in good hands. There are several types of dermal fillers on the market. The most popular ones are hyaluronic acid filers, like Juvederm and Radiesse. In the past, these fillers were used to correct acne scars, and while they do provide a nice smooth result, they only last a few months. Not only is it inconvenient, but it can also be expensive to use these types of fillers for acne scars. Bellafill is made of over 80% purified collagen. Logically, it makes sense that we would replace the lost collagen in these scars with collagen. The added benefit with Bellafill is that this product also stimulates the body to produce more of its own collagen. * This means even when Bellafill’s results do start to dissipate in 5 years’ time, studies have shown an increased collagen layer remains in the treated area, and ages in a similar aging pattern to your baseline collagen4,2. Where hyaluronic acid fillers, like Juvederm and Restylane, have an antidote of sorts, Bellafill does not. Careful placement by skilled, experienced hands is the key to creating a lasting look you love. Our injectors have been awarded Bella Diamond-Level Injector Status, a designation reserved for the top 1% of injectors nationwide. Continuing education on the artful mastery of cutting edge placement techniques keep our providers at the top of their game. Bellafill can help patients suffering from particular types of acne scars, by replacing lost collagen and creating a smoother skin surface3. The criteria for Bellafill treatment are nuanced and depend upon the actual structure of each of your scars, so a consultation with one of our physician injectors is recommended to determine which of your scars can benefit from Bellafill injections. What is treatment with Bellafill like? Bellafill is injected with a very fine needle during a comfortable procedure that requires no downtime. * Bellafill injections are well tolerated and contains lidocaine in its formulation, providing local anesthetic during the injection process. You may notice slight swelling, redness, or bruising following Bellafill injections. These effects are temporary and don’t generally interfere with any activities. Avoid sunbathing, exercise, alcohol and cold outdoor activities for six hours after treatment3. What should I do prior to treatment with Bellafill™? One week before Bellafill injections, avoid taking St. John’s wart, high doses of vitamin E, aspirin, Advil, Nuprin, and any other agents that increase bruising. If you are prone to cold sores, we may want to institute antiviral therapy before injecting near the lips. Bellafill should not be used in areas of active skin infection, including herpes outbreaks. Bellafill hasn’t been tested in pregnant or breastfeeding women. The cost for Bellafill at Well Medical Arts is $800 per syringe. Patients generally use a single syringe to treat acne scarring. However, an exact quote based upon your treatment plan will be provided during your complimentary consultation with one of our expert physician injectors. What’s the downtime after injection with Bellafill? You won’t need to take time off from most of your regular activities, but you will need to avoid sunbathing, exercise, alcohol and cold outdoor activities for six hours after treatment. How long does it take to see results of Bellafill, and how long does the effect last? *Individual results may vary. Bellafil is not right for everyone, or every acne scar. During your consultation, a physician will examine you and provide you with the best options for your acne scar treatment. If Bellafil is not a good option for your acne scar removal, Reflections offers many other treatments and technologies for improving the appearance of acne scars which may be a better fit. 2. Bellafill® [Instructions for Use]. San Diego, CA: Suneva Medical, Inc.; 2015. 4. Haneke et al. Polymethyl Methacrylate Microspheres in Collagen. Semin Cutan Med Surg 23:227-232,2004. 5. Cohen et al. Artecoll: A Long-Lasting Injectable Wrinkle Filler Material: Report of a Controlled, Randomized, Multicenter Clinical Trial of 251 Subjects. Plast. Reconstr. Surg. 114: 964,2004. 6. 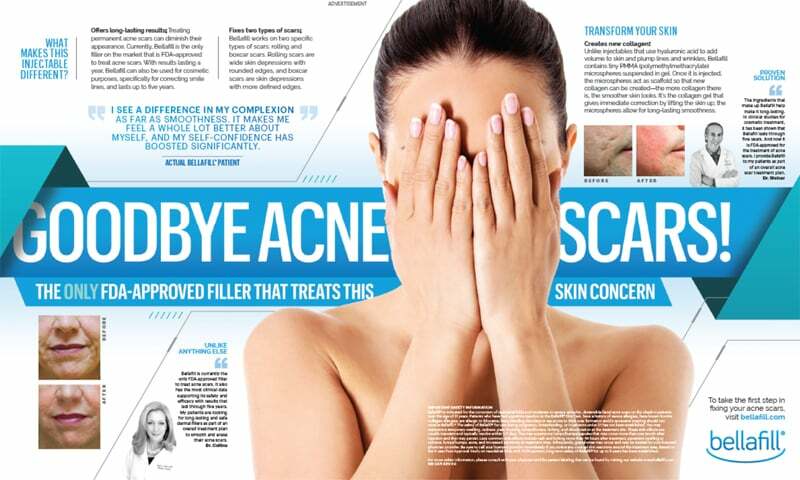 American Academy of Dermatology, http://www.aad.org/media-resources/stats-and-facts/conditions/acne#.Uc2hG_nvt8F. 7. Journal of Plastic, Reconstructive and Aesthetic Surgery, 2008, http://www.sciencedirect.com/science/article/pii/S1748681508003951.